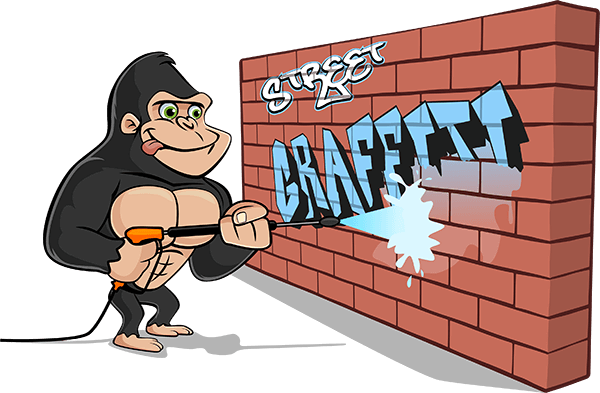 Tsawwassen Graffiti Removal - Gorilla Property Services - Call Us Now! It is not secret that taking care of your property is a big job. Between regular and seasonal maintenance, keeping your home or business running smoothly is a full time job. That is why it is such a pain when someone else makes your job even harder! Street vandals can leave tags or designs across your property quickly and easily but getting it off is extremely difficult. Lucky for you, our our Gorillas are here to help! Street artists don’t show up at your property with paintbrushes and oil. No, aerosol spray paints are the ordinary tools of the trade for graffiti. These paints are easy to transport, quick to use and you can find them just about anywhere. Has there ever been a more perfect weapon for street vandals? Unlike other types of paints, using aerosol products is not boiled down to an exact science. These paints leave streaks and overspray. What does this mean for you? It means that there is a lot more to clean up than one single design. Improper removal techniques can drive these stains into the surface of your home’s exterior. Leaving graffiti to sit on surfaces over long periods allows stains to bake into the top layers of your facade. That is why there is never a bad time to call in our Gorillas for your Tsawwassen graffiti removal. Instead of taking your Tsawwassen graffiti removal into your own hands, let us get our paws on it! Gorilla technicians are stubborn and refuse to quit until the job is done – and done properly! Our multi-step system for graffiti removal begins by treating the affected area, loosening surface stains and build-up. In order to preserve the (sometimes) delicate outer areas of your home, our cleaning compounds and tools are delicate on surfaces and hard on stains! Our Gorillas get your property back to its former glory with methods that are effective and non-destructive.